Associate Professor of English Jefferson Holdridge has written a new book, “The Poetry of Paul Muldoon” (Liffey Press), which examines the works of the Pulitzer Prize-winning poet from Northern Ireland. “Because Muldoon is Irish but has lived in the States for many years, and I am American but have lived in Ireland for many years, I felt there might be a meeting ground between us,” said Holdridge, who lived in Dublin, Ireland, for 15 years. Holdridge earned his doctoral degree from and taught at University College Dublin before joining the Wake Forest faculty in 2002 to teach Irish literature. 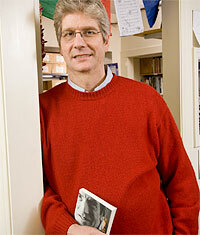 He is also director of the Wake Forest University Press, the major publisher of Irish poetry in North America. Holdridge says Muldoon is in the mold of the great Irish poets who focused on international themes. “I came to write “The Poetry of Paul Muldoon” because I was working on a study of landscape in Irish literature and was struck by how ably Muldoon considers this aspect of the Irish tradition within an international frame that includes North America.